Now, before we get into our theology of pirates, we have to face here at the start the obvious objection. Can pirates be used as a theological resource? The pirates, we know, were violent men and women. (Yes, there were female pirates, see Anne Bonney and Mary Read as examples.) Given this violence, is it appropriate to use pirates to make analogies with the kingdom of God? We take our cue from Jesus. In his parables Jesus would use provocative and startling comparisons to make a point about the kingdom of God. And sometimes the protagonists of Jesus' stories were immoral. Consider the parable of the unjust steward in Luke 16.1-13. The steward is robbing from his master. And then, when he's found out, the steward rips off his master even more, telling his creditors to slash their bills. The steward does this to win friends, securing his future after he is fired. And Jesus says, the kingdom of God is like that guy. From the days of John the Baptist until now the kingdom of heaven has been coming violently and the violent take it by force. We are perplexed by this parable. Without a doubt the ethic of the kingdom of God is non-violent. Yet, here Jesus says that the kingdom of God "comes violently" and demands a "violent" response. And Jesus said to them, “When I sent you out with no moneybag or knapsack or sandals, did you lack anything?” They said, “Nothing.” He said to them, “But now let the one who has a moneybag take it, and likewise a knapsack. And let the one who has no sword sell his cloak and buy one." Again, we know that Jesus is not expecting his followers to actually use swords. In the very next chapter of the gospel of Luke Jesus tells Peter to put his away. So the reference to swords is puzzling. And beyond these direct comparisons to violence, the characters in Jesus' parables often act violently. All that to say, Jesus often used violence and violent people to say "this is what the kingdom of God is like." So how are we to make sense about Jesus' use of violent imagery? Returning to Matthew 11--"the kingdom is coming violently and the violent take it by force"--the violence of the coming kingdom is an apocalyptic violence, the kingdom of God cracking into and invading our lives. This is what Jesus means when he says the kingdom brings a "sword" to earth. The kingdom of God rips the fabric of our world, a rupture is introduced, a division. When the kingdom arrives nothing can ever be the same. The kingdom brings a crisis upon us. And that introduces a moment of decision. The kingdom breaks violently upon us. Like Saul on the road to Damascus. And in that moment, as Christ stands before us, we are asked to respond in kind, to seize the kingdom aggressively and violently. No half measures are acceptable. No delays. The time is now. The crisis is at hand. To borrow from Jesus' other parables, when the kingdom breaks violently upon us we sell all we have to buy the field where the treasure is buried. We push in all our talents rather than burying them safely in the ground. When the invitation comes for the wedding feast we do not give excuses or tarry. As the kingdom breaks violently upon us it demands a response in kind. When Jesus says "Come" we leave our nets upon the shore to follow him. When the kingdom comes violently upon us we must respond in kind. 100%, all in. The trouble we have with Jesus' parables is that we moralize them. We turn the parables into Sunday School material, each parable a fable with a little moral lesson. But the parables are not moral lessons. The parables are comparisons, often startling comparisons, describing the nature of the kingdom. And as we've seen, Jesus is not shy about using immoral and violent images or people to draw attention some aspect of the kingdom. There is a "violence" to the kingdom, the way the kingdom breaks into our lives and the response the kingdom demands of us. That is the kingdom breaking violently upon us and the violent response it demands, the "sword" that cuts through our lives, the moment of crisis now at hand. All that to say, Jesus had no problem using violence and violent people to make provocative declarations about the nature of the kingdom. The kingdom of God comes violently, Jesus said, and the violent take it by force. 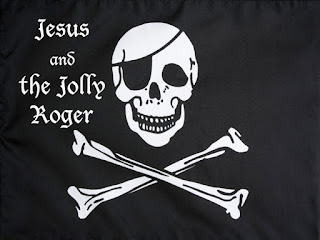 Like I said, the kingdom of God is like a pirate.